Brand New WordPress Plugin Out! The ImageRecycle plugin for WordPress is the go-to plugin to optimize your media files, saving on server space at the same time. If you’re a long-time user of ImageRecycle, we’ve got great news. And if you’ve never used it, then we’ve got all the arguments for you to use it! Version 3.0 of ImageRecycle has been released, and it comes with even more improvements for your media files. Let’s dive in! Nothing says quality like a website’s speed! The new ImageRecylce plugin comes with a new indexing technique to fire up your WordPress website. Moreover, thanks to another hashing technique, ImageRecylce 3.0 is now smarter than ever. Most importantly, the inner workings of the indexing procedure are abstracted behind one small button. In fact, to index your media files in ImageRecycle 3.0, simply click on the index images button in the plugin, and wait for the process to finish! Using a hashing function, ImageRecycle will also be able to detect whether a file has been updated. This is invaluable if you replace an image and forget to optimize it. ImageRecycle will automatically detect that the image has been replaced with a new version, and that it might require optimization. Imagine compressing all your images to save space on your WordPress website, only to change your mind and decide to retain the original version. What do you do? ImageRecycle 3.0 now lets you re-index all your images, changing the optimization type to suit your needs. To reset the status of your images, head to the settings page and press the reinitialize button. As from the newest version, ImageRecycle also comes with new means to oversee errors. A new log has been implemented, ensuring that you will stay on top of any issues with your WordPress and ImageRecycle problems, such as wrong API keys or permission issues. 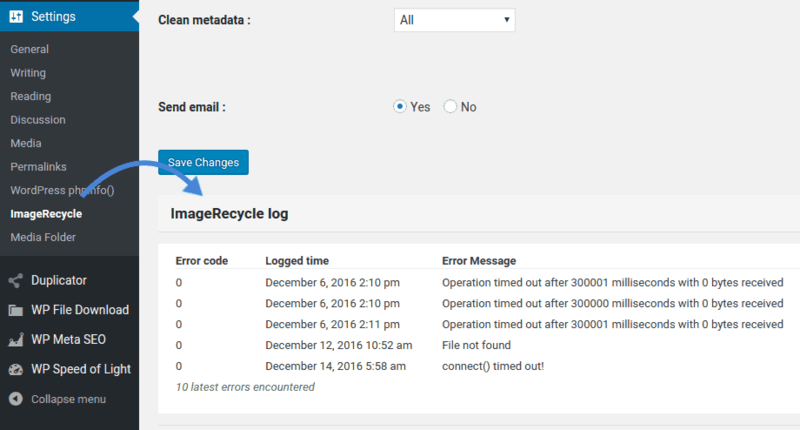 The error log is available at the bottom of your ImageRecycle 3.0. settings page. If you’re experiencing issues with your WordPress plugin, a good starting point is this log. Simply click on the title to see the most recent error messages. One of the most prominent new introductions in ImageRecycle 3.0 is the possibility of managing the Exif metadata of your image files. Exif data contains information about the location where pictures were taken, and other details about the camera and the settings used to snap the picture, among others. Three modes are available when dealing with metadata - you can preserve all, none or only some of the metadata. You can choose what metadata to retain in your images, if any, from the ImageRecycle settings page. Select what Exif information you want to hold onto, and save changes! Finally, if you have ever felt lost while waiting for ImageRecycle to optimize your files, there’s good news awaiting you! 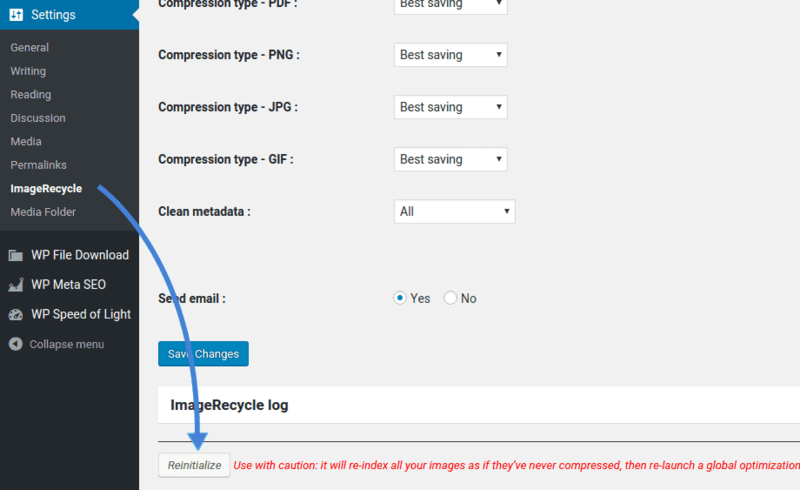 ImageRecycle 3.0 now shows a progress bar whenever you optimize or compress your WordPress images. A great plugin, have used a few before but I really like Imagerecycle. Never had an issue with other plugins either installing there plugin. I'm Installing it now on all my wordpress sites.